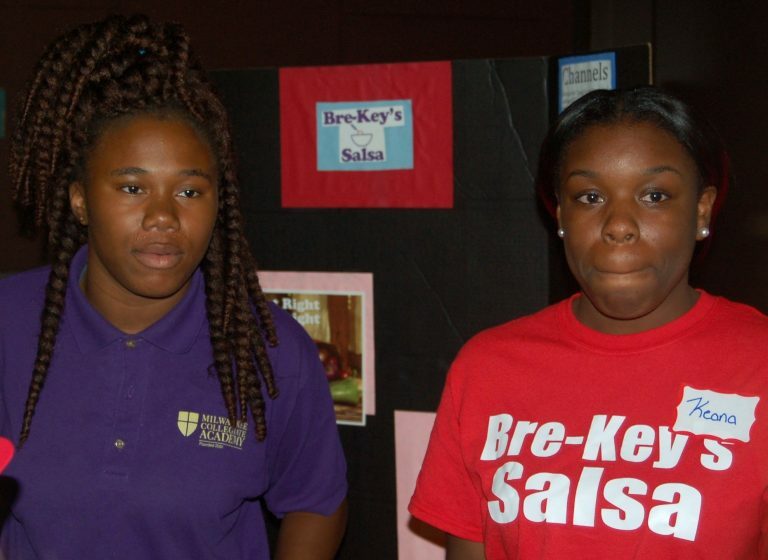 Briana Beal (left) and Keana Nelson developed a line of salsas for the product competition. Photo by Andrea Waxman. Desire Sconiers and Taminisha Hughes stood in front of a cardboard presentation board adorned with information about Saucée (pronounced saw-SAY), a healthy sandwich spread they created. Speaking to a small group of adults gathered before them, the 16-year-old students explained the two flavor variations they developed, Zesty Zucchini and Cool Cucumber. They are considering a third, Spicy Sriracha. “We are Saucée, where we make sauce, like a boss,” Sconiers and Hughes chanted in unison. The two are paid interns working for the leadership development nonprofit Teens Grow Greens. Like the other six members of their cohort, Sconiers and Hughes repeated their presentation to 70 business leaders and supporters, who circulated around the room at the first annual Teens Grow Greens Pitch Night, held in the 88Nine Radio Milwaukee building, 220 E. Pittsburgh Ave. Other original product lines pitched by the 14-to-17-year-old interns included salsas, soaps and freezer pops. Briana Beal, a senior at Milwaukee Collegiate Academy, 4030 N. 29th St., and Keana Nelson, a junior at Riverside University High School, 1615 E. Locust St., designed a salsa that can be customized on the spot at festivals and farmers markets. Ja’Kobe Patrick (center) and Daisha O’Bee (right) talk about their product idea, Soapery, with Pitch Night attendees. Photo by Andrea Waxman. While selling Teens Grow Greens’ signature acai bowls, Beal and Nelson noticed that buyers were hesitant to purchase products that took time to make. To speed up the process, they developed a pre-mixed salsa base to which they can add tomato or pineapple, according to a customer’s preference. All products were required to have a “triple bottom line,” according to Teens Grow Greens co-founder and director Charlie Uihlein. That is, they have to be good for the planet, good for people and make a profit. Since the program focuses on teaching leadership and character development through growing and cooking healthy food, it’s not surprising that all of the products incorporated plants, Uihlein said. Teaching how to be healthy is an important goal of Teens Grow Greens. “Teens who have better knowledge of what to eat can pay more attention in class and studies show they do better in school,” said Uihlein, 32, who founded the organization with his wife Rachel in 2013. Uihlein said his motivation to help young people learn how to become leaders comes from his own story. “I know what it was like to not feel successful, to not be in the driver’s seat of my own life.” Explaining that he was not a good student, Uihlein said he wishes he had been able to find success earlier. 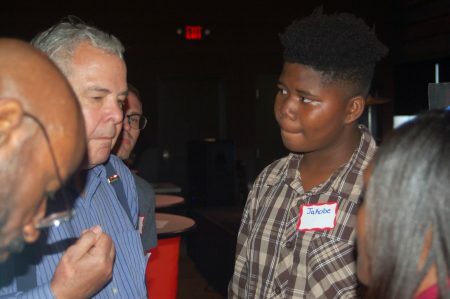 “Everything we do (at Teens Grow Greens) is for the teens to learn leadership,” Uihlein said, and to help them develop skills and character traits such as resilience, responsibility, self-worth and communication skills, which are all integral to becoming successful and fulfilled individuals. Though building entrepreneurial skills has been part of the program since the initial interns started in February 2014, this year was the first in which Teens Grow Greens partnered with MKEGrind, a youth-focused career development company. MKEGrind founders Sylvia and Thomas Wilson provided eight weeks of in-depth training, including business planning and marketing, Uihlein said. This, too, was the first year in which interns were assessed on product development and presentation. On Pitch Night, a panel of five judges chose one winner for the best pitch and another for the fluency of the pitch. Judging the competition were Tina M. Chang, CEO, SysLogic; Juli Kaufmann, president, Fix Development; Andy Nunemaker, CEO, Dynamis Software Corporation; Beth Ridley vice president of marketing strategy, Northwestern Mutual; and Ronny Thompson, CEO, PeachyClean. Tami Nunez and Thadniya Glaude were selected for the best product pitch for Peppy Pop, a fruity frozen pop, and Sconiers and Hughes won for fluency. Ridley, who announced the winners, commended Nunez and Glaude for the novelty of their product idea and their research. She praised Sconiers and Hughes for their thorough knowledge of their product and their ability to answer questions about it. The Teens Grow Greens interns will sell their new products at the Cathedral Square Market on Saturdays, Sept. 24 and Oct. 1. Congratulations to all involved! Hope this wonderful program keeps on growing!